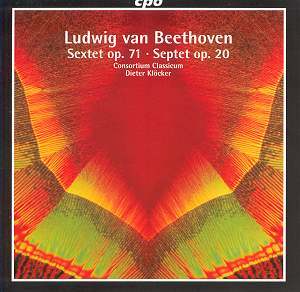 CPO bills this as part of its "Dieter Klöcker Edition"; is Klöcker, the Consortium Classicum's guiding light and principal clarinetist, really so prominent an artist as to merit a Recorded Edition? The present recording, an analogue reissue from 1974, is an EMI Electrola production - the disc neatly incorporates the EMI Classics logo into the standard CPO label design - but I don't recall any LP appearance Stateside, either on Angel or on any of its licensees. In this Sextet performance, dark hues dominate the overall sound more than usual - I became very aware that the piece calls for an ensemble of low instruments. Beethoven exploits the clarinet's long range and concomitant registral changes to inject some brightness into the dark-hued ensemble, especially in the first movement, where that instrument carries most of the melodic material. Paradoxically, the sonority here is also unusually transparent: once past the close-positioned opening chords, which suffer the sort of buzzy congestion that suggests pre-digital overload, the textures are consistently easy to "hear through." The inner movements, in which the bassoon and horn assume more prominent roles, remain dark. Only in the Rondo finale does the music climb into a higher tessitura; in this bubbling, high-spirited rendition, the players tackle the technical challenges and brief display opportunities with obvious relish. After the Septet's brief slow introduction, timbral warmth tempers the first movement's basically energetic, propulsive manner, with the clarinet and horn full and resonant in their solo spots. The Adagio cantabile is grave and dignified; there's a hint of a rustic edge in both the tone and the phrasing of the Tempo di menuetto. In the fourth movement, the players underline the ominous undertones of the minor-key variation, the better to set off the genial surrounding material. I have heard more athletic, infectious performances of the Scherzo, but the Consortium find a nice lilt in it, shifting into a more easygoing, gemütlich gear for the Trio section. There's enough of a suggestion of hurtling forward to keep the finale going, even in the brief, more formal episode at 3:38 with its overlapping parts; earlier on, the string playing has sounded a bit bashful and restrained, but the violin suddenly and correctly turns brilliant in the rising repeated notes at the finish. Good work, then, and good music-making all around; fans of Klöcker or the Consortium will be pleased. But there are preferable individual versions around, including the Gaudier Ensemble's take on the Sextet (Helios) and the St. Martin's Academy Chamber Ensemble in the Septet (Chandos).